and selected "Mount Volume" from the right-click menu of the share I wanted to access. I have no clue why the Gnome/Nautilus designers decided to hide the mount point when the most obvious reason to mount a share is ti ACCESS it. To avoid this confusion in the future (I have an awful memory) I decided to create a symlink in my home folder to .gvfs. Now when I want to mount a remote folder I can find the mount point very easily. Do you know what was the reason to hide it in the first place? Over the years that the FLOSS Fund has been running, I have been surprised that people have such a hard time finding projects to nominate. I run into neat projects frequently. FreePOPs, a neat POP3 proxy I used to rescue my e-mail from Yahoo! 's servers. Cacti, which is a great tool for graphing network activity. pfSense, which is a pretty nifty firewall project. OpenWRT, which has converted many a consumer-grade router into something featureful. TrueCrypt, which (although not perfect and not DSFG-free) is an excellent cross-platform no-cost encryption tool that even non-technical users can use. VLC, which makes multimedia tolerable on Free Software platforms. Imagemagick. Ha ha who uses Imagemagick anymore, right? You might be surprised. Squid, which is an immensely popular proxy/cache. These are a few projects which I use and which I find useful (even inspirational). You probably have some too. Even if you don't nominate them for the FLOSS Fund, it is worth thinking about them and appreciating them. KWLUG - The Kitchener-Waterloo Linux User Group is a monthly meeting of GNU/Linux, Free Software, Open Source and technology enthusiasts. We meet in Kitchener, Ontario, usually on the first (non-holiday) Monday of the month. 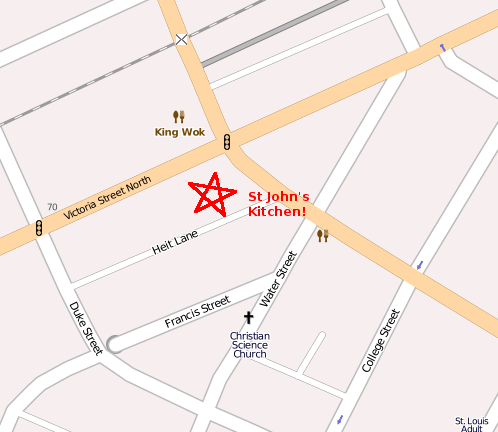 (Directions) Our meetings are free and open to those with an interest in Linux. Find out more about our meetings. Join our mailing lists. The Kitchener-Waterloo Linux Users' Group is a group of computer enthusiasts that meet on an ad hoc basis the first non-holiday Monday of every month. Using various flavours of Linux as a base, instead of Microsoft Windows variants, volunteers present on topics that have caught their interest. Although called a Linux user's group, the focus is seldom on Linux itself - instead, the focus is on what people do with computers, be it browse the web, use maps, edit photos, or program - typically, experiences apply whether using Linux, Windows, or any other operating system. The focus is on what we do with computers, not, generally, the nature of the computers themselves. Inevitably, however, the very nature of describing something interesting that was done leads to a technical discussion as to how one goes about doing it. kwlug is a computer group, it is technical – if you don't mind being dropped in the deep end of the pool, you will thrive. kwlug is free and open to all to attend, participate, contribute, or just lurk. No expertise or experience is necessary, merely a desire to learn. Come share in the mutual support of like minded people. It is more accurate to describe kwlug as a free software users' group, not a Linux users' group. All software used is available via free internet download. It would be even more accurate to say kwlug is a FOSS users' group, a particular type of free software - the important point is that not only is there no cost to kwlug, there is no cost to the software. FOSS provides an equal playing field, whether you are a home hobbyist or a large corporation, being barrier free with a very low, and most often no, cost of entrance. In most every case, there is a free and popular equivalent to most any non-free software application. Skills are almost always transferable, and directly applicable, to proprietary versions. There is no cost to be part of kwlug, there is no cost to the software used - everyone is able to fully participate and expand their horizons and skills. There is no barrier to entry, and mutual encouragement and help is but an e-mail away. Newcomers to the subject can be confused by the term "free". In the context of free and open source software, "free" is intended to refer to the freedom to copy and re-use the software, rather than to the price of the software. The Free Software Foundation, an organization that advocates for free software, suggests that to understand the concept, one should "think of free as in free speech, not as in free beer". kwlug meetings - location facilities criteria. The following appears to have been well received by kwlug as an accurate description of what kwlug looks for in meeting location facilities. Comments for refinement are most welcome - please post them to kwlug-disc. Wherever we go, we're going to need to manage and meet the expectations of whomever our hosts are, particularly if the space is free - show that we are relevant to the K-W community within which that free space sits. We also need to know what sort of meeting space we'd like to see. - cost of entry must be absolutely free. - reasonably nearby parking of sufficient size must be free. - on a main bus route. - big enough, for, say, 40 people, on average. - QUIET. Working Centre noise is what drove us to look for alternative sites. - preferable, but we seem to manage if the site doesn't have them to hand: projector, some form of sound system (unless the space is small and quiet enough to not need them.) Best if microphones aren't needed. - white board? Meeting signs to direct people? One of those giant pads of paper and stand? - would be nice if larger alternate on-site space were available by pre-arrangement for the better attended topics, e.g. MythTV. - would be nice if there was space on-site to grab a bite rather than having to go elsewhere. Such would also probably facilitate our 'ask your neighbour' recommendation. 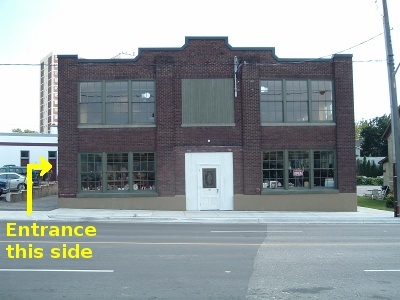 Would space, but no restaurant, be acceptable? - personally I'd prefer to be in K-W, and not the heck the other side of Kitchener. - Free internet access present. Of some reasonable speed. We have shown that we can largely do without, at the Working Centre, but I don't think people really want to. Enough netbooks are present that I think given two relatively equal choices - one with access, one without, the internet location will be chosen hands down. Even if only for the presenters to be able to show us the web site of whatever they're presenting on. - not at the Universities - aside from the cost of parking, I think we collide with similar groups already on campus, and they have a slightly different direction than kwlug. (Nothing prevents people from attending both.) kwlug seems focused upon 'downtown everyman', not post-secondary students / academia. No offense to anyone. There's another aspect that I think we should also discuss. Manulife would have been a fantastic place to meet, probably a really nice setting and environment, but perhaps off-putting to some. On the other hand, the Working Centre, given its raison d'etre, is inherently visible and welcoming to newcomers. Not as stark as a gymnasium but probably not as swank as Manulife. 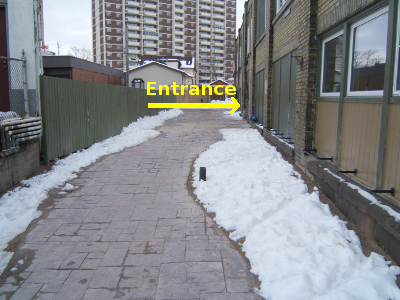 Does the kwlug community have a preference or leaning towards one environment or the other? This will be the shortest post from this series. There you will find all the steps in detail and a wealth of extra information regarding the WebHuddle configuration. I did my installation on a minimal Debian install and the instructions worked for me. The kwlug group on BigTent has now been created. Think yahoo / google groups on steroids. The only such I've come across that allows subgroups. It includes forums, news, events, photos, files, calendar, reviews, polls, e-mail (I think) and I don't know what all else. I've, so far, only created forums for General Discussion, kwlug Discussion, and New Member Help. The only event is the Jan. 4 meeting. If it's useful, go ahead and start using it. I can create sub-things as demand is identified, create group, file, forum, admins/moderators, whatever, and so on. Do you have a URL for this? On the previous post I showed you what you could do with OpenMeetings. Now it's time to describe how to install it on your own server. Although you can install it in any version of Linux provided you have access to the proper dependencies, I decided to do the set up on a minimal installation of Debian 5.03 "Lenny", that way I could ensure I identified all the components needed. This will also ensure that if you want to install it in a different Distribution, you have all the elements to do it. The total installation time was a bit less than two hours. It may be more or less for you depending on the speed of your computer and Internet connection. You can find the short version of these instructions on the OpenMeeteings website. Those instructions were my starting point. Here I will add all the detail required. A computer to work as the server: Minimum recommended: 1 GHz CPU, 1 GB RAM, 2 GB HDD. If you don't have an additional computer you can do the installation on a virtual computer. Just ensure you assign enough CPU, RAM and a large enough HDD. From now on I will refer to this computer as the "server"
From now on I will refer to this additional computer as the "local computer"
When asked to select the kind of system, just leave "standard system" selected. Nothing more. Login to the server as root and continue with this instructions. This step is not required but you will save a lot of time using cut and paste instead of typing all the instructions. Get the address assigned to the server and write it down. Note: On the following instructions I will use 192.168.1.97 as the server address. Please adapt the address accordingly. Now you will have a terminal where to paste the commands that follow in these instructions. You'll be glad that you followed this advice. Install the rest of the components from the repositories. Note 1: This is a very long line. Type it all in a single command line. Note 2: Don't leave unattended. The installation process will ask to provide a password for MySQL and to accept the java distribution license. Optional: Cleanup the apt-get cache. This will free quite some HDD space. We are almost done. It hasn't been too bad, has it? Get the latest version of OpenMeetings. You can figure out which version you need from the OpenMeetings web site: http://code.google.com/p/openmeetings/downloads/list. OpenMeetings requires MySQL to use UTF8 by default. Once you accept the configuration it may take a long time (about 10 minutes) to complete, so be patient. It is normal. At the end of the process you will be able to open your first web conference!!! You are done!... Well, almost. Although you can manually start red5 every time, I am sure you'd prefer for it to start as a daemon every time you start the server. I've created the startup scripts followig the standard Debian init.d conventions. You can find the scripts attached to this post. Untar the startup scripts and upload them from the local computer to the openmeetings computer. 5080, 8100, 1935 and 4445. If you prefer to use different ports, you will need to modify the red5 and OpenMeetings configuration files, but that's outside the scope of this post. As you can see, setting up the server is not too difficult. Nothing to compile and very little to configure. Have fun using this tool. All the tools and methods described on the previous posts work very well with a small number of people sharing a desktop or collaborating, given that access must be granted and computer addresses shared, they work well within a trusted group. For situations where you need to collaborate with "untrusted" people or with a large number of people, the best option is to use web conferencing software. As the slide indicates there are many on line providers where you can subscribe either for free or small monthly fee and you can start hosting conferences on their servers. There are a few with Linux Clients, some "even" allow to share the Linux desktop. The market is moving so fast that I'm expecting that this list will grow and change quite rapidly in the next few years. 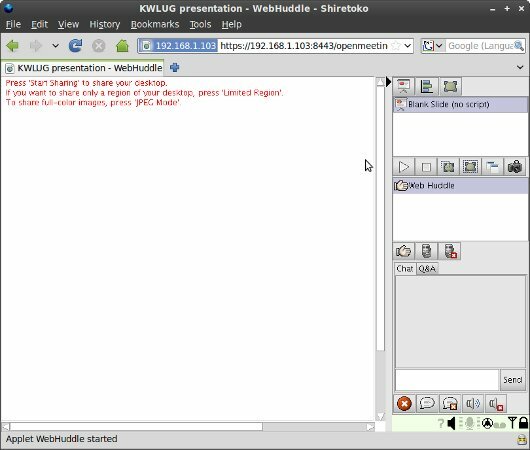 For the KWLUG presentation I decided to focus on two Free Software applications, OpenMeetings and WebHuddle, which can be hosted on your own servers, branded, and otherwise modified. Not under active development but it is not a dead project. It's a solid finished product. The original developer still answers questions in the forum. 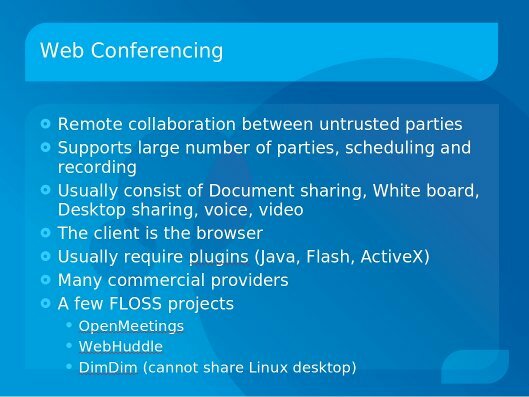 Web conferencing is an excellent collaboration technique for distributed groups as well as a great medium for presentations to remotely dispersed audiences. Whether you set up the server yourself or you use a vendor hosted solution, you can be sure that there are options for Linux, try them, you have nothing to loose and a whole lot to gain. On the next two posts I will show you how to install the two servers described in this post. On my post about XDMCP I mentioned that there was a better way to open a X session on a remote computer. Nomachine, creators of the NX protocol, have a closed source implementation of the protocol, with free (no-cost) versions for both the client, server and nodes and also paid support plans. They've open sourced the compression algorithm and protocol and provided very detailed documentation. 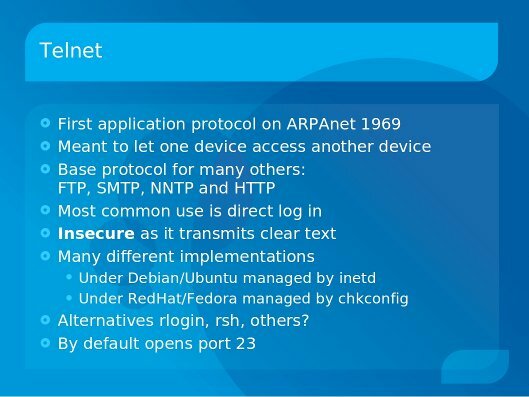 Although the server must run on an Linux/Solaris/BSD system and natively provides support for the X protocol, the server can also work as a gateway to access RDP (Windows Terminal server) or VNC connections to other Operating systems. It can start a full session similar to XDMCP or a single application, similar to SSH X forwarding. Here is a diagram of NX in a nutshell. 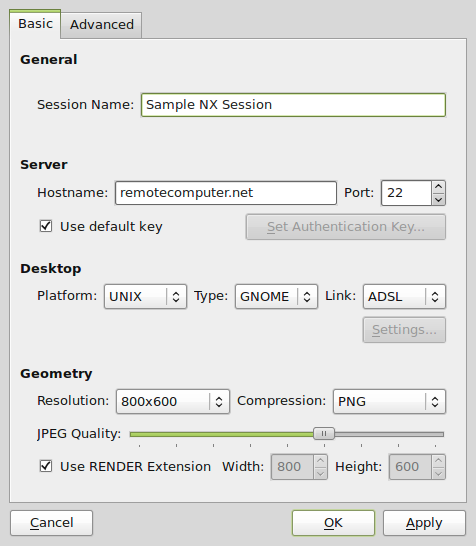 To use NX you must install the server on the remote computer and the client on the local computer. Note: The server must have a properly configured SSH server. The client must be able to SSH to the server. i.e. the port must be open and security properly set up. But it is basically Download and execute the installers. Once the server has been set up, and the client installed, creating a new session is quite easy. Just start the client, and define the server address, desktop environment and geometry. Here is a snapshot of QtNX, Although comparative to the no-machine closed source version this client provides less functionality, it is still quite usable. 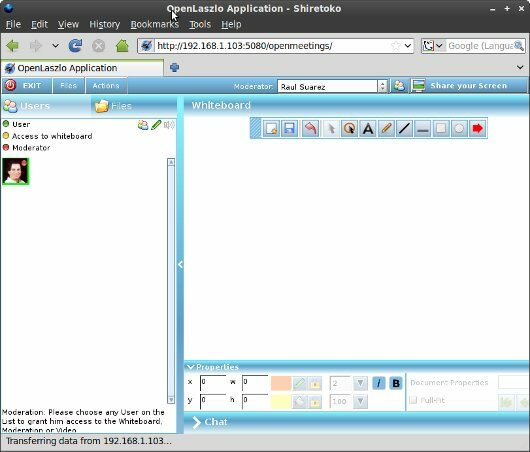 To connect to a Windows server through Remote desktop or to any OS through VNC, you must have a Linux server on the same side of the network as the server you want to access. This means that when configuring the session you must define both the Linux server address and the address of the destination server as seen by the Linux server. Up to now the graphical solutions I've shown were focused on accessing the X desktop. I've also focused on accessing a session exclusively. On this post I will talk about a tool that is OS independent. You can share a Mac or Windows or Linux desktop and that allows remote collaboration with multiple people looking and controlling the same desktop. VNC uses the RFB protocol to transmit keyboard and mouse signals to remote computer and receive back the graphical screen. Most implementations under Linux allow sharing a secondary session but a few allow sharing the main desktop. Of course you can open additional sessions. This is useful when you want to have multiple people working on the same computer on different sessions. Sometimes (usually due to port blocking) you need to have the client waiting for the server to open the connection. 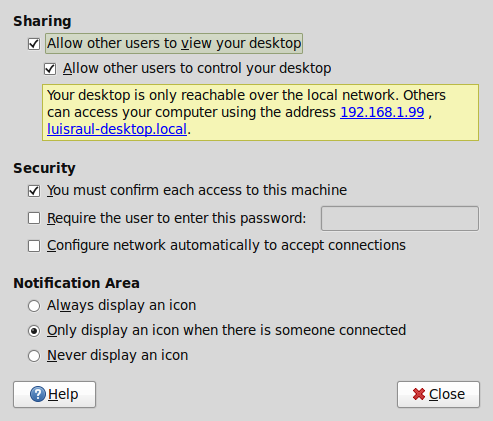 When connecting to the main desktop there is no additional configuration. But when connecting to an additional session you must specify what kind of session it is. You do this by modifying the ~/.vnc/xstartup script. The VNC protocol opens by default port 5900. The KDE client has some nicer features such as scaling and full screen "on the fly"
XDMCP stands for X Display manager control protocol. The display system used in Linux was designed from the beginning as a network protocol, where the system and programs run in one computer and the display being shown on another. The XDMCP protocol allows you to login graphically to a remote computer. It is not a very fast protocol and these days there are better ways to achieve the same effect in a more efficient manner. As of Gnome 2.2 and KDE 4 support for XDMCP login on the GDM/KDM login screen was dropped. It is still possible to configure and setup XDMCP under those environments but it was easier when the distributions set it up from the get-go. 1. On the Login manager select "Session"
2. On the session Menu select "Secure remote connection"
3. Select the server you want to connect to and login. Gah. Once again I forgot you can't attach pictures directly to meeting locations. For different reasons, some people prefer Graphical interfaces, whether it is because because they are more comfortable with them or because they may set-up a non technical person for remote access. On the past two posts I presented command line tools. These tools require, for the most part, remember cryptic parameters, configuration file locations and unless you script them, you need to enter the whole command every time even if you are doing the same day after day. Being this a GUI tool It requires less words to explain. Using your distribution package manager search for it and install it. I still haven't found a distribution that does not include it. Once the connection has been created you can do additional configuration. There are many different configuration categories. Window: This is aesthetic. How do you want the terminal to look. For SSH, for example, you can configure almost everything that you can do from the command line and configuration files. You can enable X11 forwarding and open tunnels, including reverse tunnels. Once you complete configuring your session, you must go back to the main session configuration page and click "Save". Note: If you click "Open" before saving, you will connect with everything you just configured but the configuration will be lost as soon as you close the session. 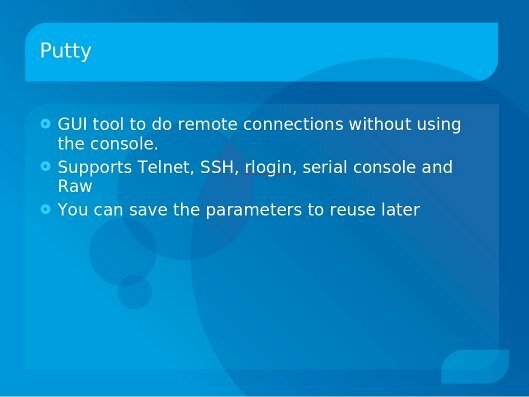 The next time you open putty you will see the list of saved configurations. Just select the configuration you want to use and click "Load"
You can then modify the configuration, re-save it or simply click "Open" to connect to the remote computer. Note: The first time you connect you will be prompted to accept the host key. 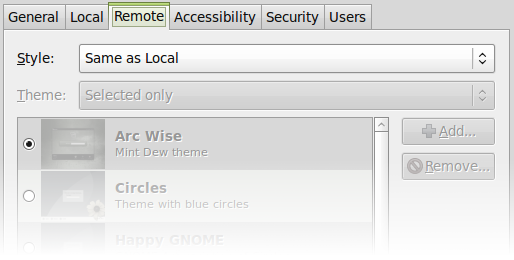 On graphical environments such as KDE or Gnome you can create icons that launch an application. The trick here is to use the -load parameter followed by the name of the saved connection. The second command in the series is the one I find more useful and versatile so it also will be the longest post. Different implementations of SSH will have slightly different features. In this case I will focus on OpenSSH. Note: if you configure SSH to listen to a different port as explained later in this post, replace 22 with the port configured. Once the server is running you can connect from other computers as long as the port is not blocked by a firewall. Sometimes you will need to copy a file (or folder) from your local computer to a computer where you have SSH access. SSH provides a command that allows you to do a secure copy "scp"
OK, accessing the remote computer and executing commands is handy and exciting and maybe all you need to do, but what if you want to run a graphical application on the remote computer? The program will be actually running on the remote computer but the Graphical interface will show in the local computer! 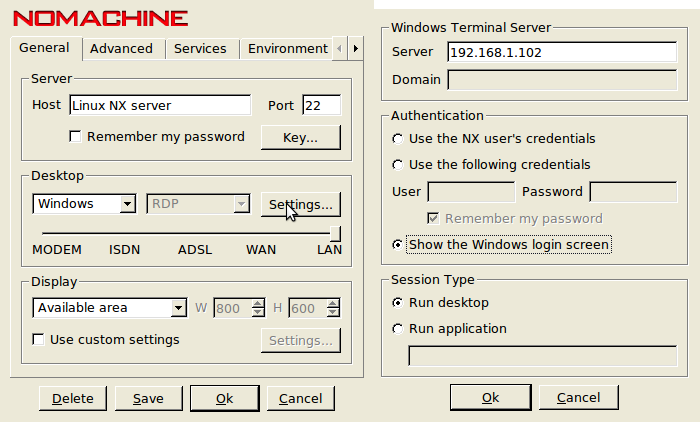 Note: When using X forwarding this way, we refer to the program running on the remote computer as "the client" and to the local computer displaying the GUI as "the server". One of the most powerful features of SSH is the ability to "forward ports" sometimes referred as "tunneling"
Port forwarding allows forwarding of TCP/IP connections to a remote machine over an encrypted channel. This is, imagine that you need to FTP (port 21) to a remote computer which is behind a firewall that only allows SSH connections. If you want the remote computer to access a port on yours but you are behind a firewall that closes all incoming ports, you do "reverse tunneling"
Now the remote computer can FTP to your computer using port 50021. Note: you can specify any available port you want on the remote computer, but you must specify the correct port listening on the local computer). You can tunnel (and reverse tunnel) various ports on the same ssh command. You can even indicate that the remote computer should forward to a different server! I personally use reverse tunneling to SSH to my father's computer which is behind a firewall. He just needs to execute the ssh command to connect to my computer opening a reverse tunnel for port 22, I can then SSH back to his computer using the reverse tunnel. For example, to prevent portscans use a different port by editing sshd_config and specifying the port. There are some very good examples of port forwarding, just search for them. There are Windows equivalents - useful as clients for these servers, or as servers for these clients. Typically, there are two ways to go about this - standalone, or as part of Cygwin. - after installation, particularly of the ssh server package, everything is almost exactly the same as described in the blog post. Probably the hardest part is getting used to the file structure / configuration file locations. - substantially, these are Linux equivalent command line facilities. Graphics, X, KDE, etc., are out there, but not as solid as base / command line cygwin itself. I'll start this series with the simplest and oldest command. Remember, it is not safe to expose telnet to the internet. Under Debian, the telnet daemon is started by inetd when the port is accessed. This is controlled by the inetd.conf file. If the telnet line is commented out, telnet will not start, otherwise it will start. After modifying the inetd.conf file you must restart inetd for the changes to take effect. kwlug logo, with text, posted. Was looking for a kwlug logo but didn't find any with text - so cut out the logo and words from mud.jpg (from the tar download available on the resources page: /node/404 ). Here is the result(s). Phew! It's been a week since the KWLUG meeting where I talked about remote collaboration. Believe or not, I hadn't had a moment, until now, to make good on my promise to post the tutorials on-line. First I was on Project Management training in Toronto from Monday to Wednesday, then, Thursday and Friday preparing for an implementation at work that kept me at home in front of the computer all Saturday and Sunday. How is this relevant to the collaboration topic? Well, For this implementation we had people at several locations in Halifax, Toronto, KW and Argentina. Most people working from home. Most of the work done remotely on the servers. To coordinate the work, I recommended the main project manager to share the task by task schedule through an webconference while we were on a phone conference. We had some hiccups that required modifying the schedule on the fly. Everybody was able to see the changes and agree with them with little discussion and even less confusion. While I was on a 2 hour break during a long running task I received a call from a different team doing a different, unrelated release. To understand the problem I opened another webconference to allow the developer share her desktop and explain it visually. Once I saw the problem I was able to provide a solution in a couple of minutes. Trying to explain the problem over email or even on the phone would have taken substantially longer. Ultimately, even though I was working all weekend, I was able to do it in my pajamas in the warmth of my home and I didn't miss a beat. The rest of the week I will post one topic per day, including a bit more detailed instructions that I didn't have time to present. I hope you enjoy and contribute with even better ways to do what I'm doing. The local Ubuntu group Ralph Janke initiated is here: https://edge.launchpad.net/~ubuntu-waterloo-region. It seems that the time was well spent preparing this presentation. I had an awesome and engaged audience that kept with me through out the presentation, even while we were trying to sort the technical limitations of the physical space. Unfortunately it seems that the webcast wasn't as successful due to the limited bandwidth at the meeting location. Next time I'll use plan B. If you logged in remotely, please let me know how was your experience. was the sound good? was the screen choppy? What would you like to see for next time? I guess the same questions go to the people that were at the presentation. I you have suggestions on how the presentation could've been better, please let me know even through the list or to my email if you prefer direct communication. I'd really appreciate the feedback. As promised, I've uploaded the presentation slides to the meeting invitation. In future posts I will write down the tutorials for the tools I used. I'm right now too tired and going to bed. Thank you to all the people that came to the presentation, that is really what makes it worthwhile. I will never admit to going to a Linux launch party. No siree. But if I had gone to a hackerspace party and been coerced into presenting something, I might have made some slides like these. The zip file contains slide sources and configuration snippets. I am puttting them here because I don't want to make an account on the Kwartzlab wiki.